Just like the game before it, the full series of Life is Strange: Before the Storm (2017) is getting a physical release. The news came by way of Square Enix and Deck Nine, who announced that three physical versions of Before the Storm will release in March 2018. Two of the physical versions will only have slight differences, while the third, a vinyl release, will no doubt be vastly different from the others. 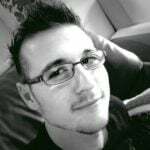 Getting right into it, you can expect both Standard and Limited Edition versions of the game. 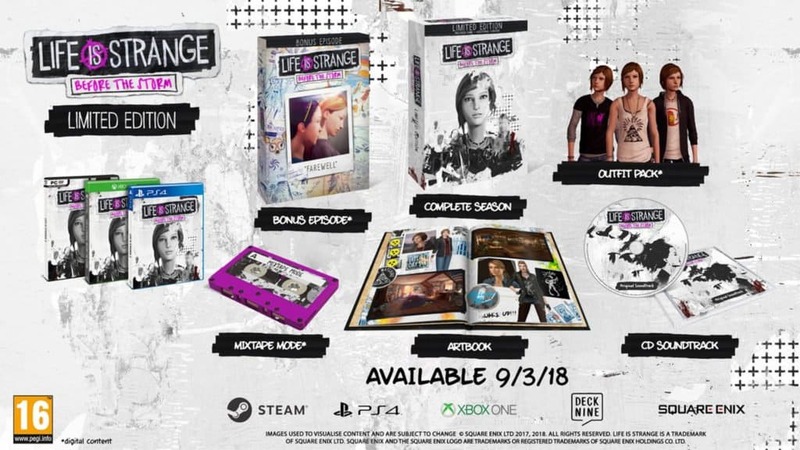 The Standard Edition includes all Life is Strange: Before the Storm episodes and a bonus episode called “Farewell”. 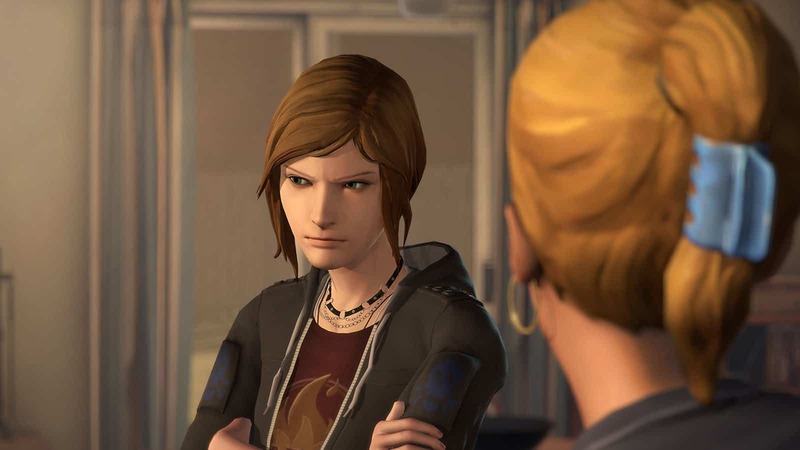 It also includes a digital download of the first episode for Life is Strange (2015); three outfits for Chloe; and a mixtape mode that allowed players to use the game’s licensed soundtrack to create their own playlists. It costs $30 USD (~R370 ZAR). The Limited Edition includes everything listed above, as well as an artbook and CD containing the game’s soundtrack. It only costs $40 USD (~R500 ZAR) and is well worth it, considering the soundtrack alone. The Vinyl Edition is where it is at for collectors, however. It is a Square Enix Store exclusive and contains everything from the Standard Edition, as well as a vinyl music set of the original soundtrack. It also includes a CD of the soundtrack, a physical art book, and a fancy presentation box. 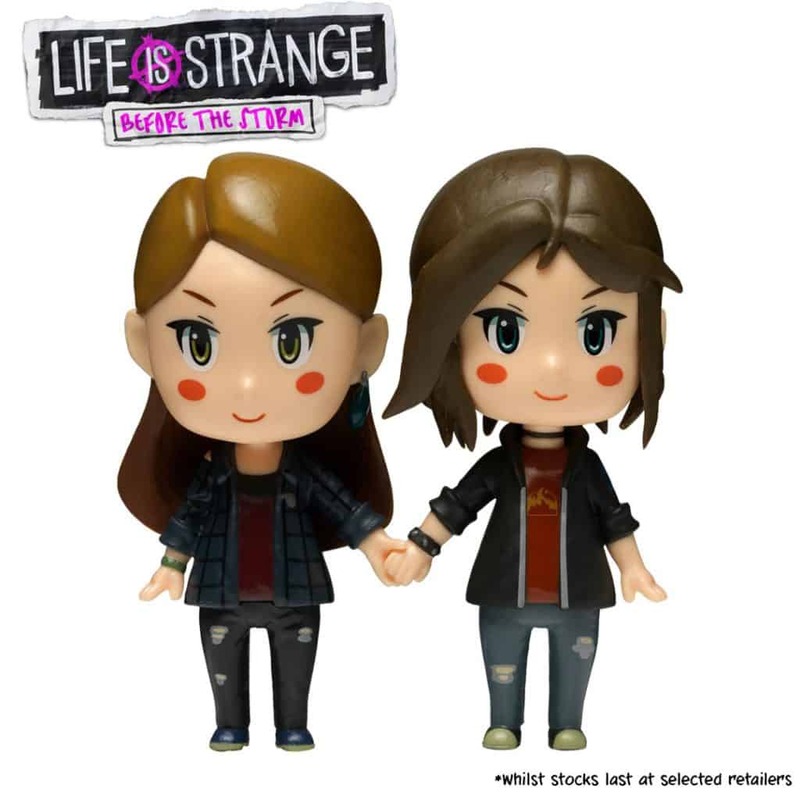 By pre-ordering the Vinyl Edition, players get an exclusive Chloe and Rachel figurine, as well as the Classic Chloe outfit. 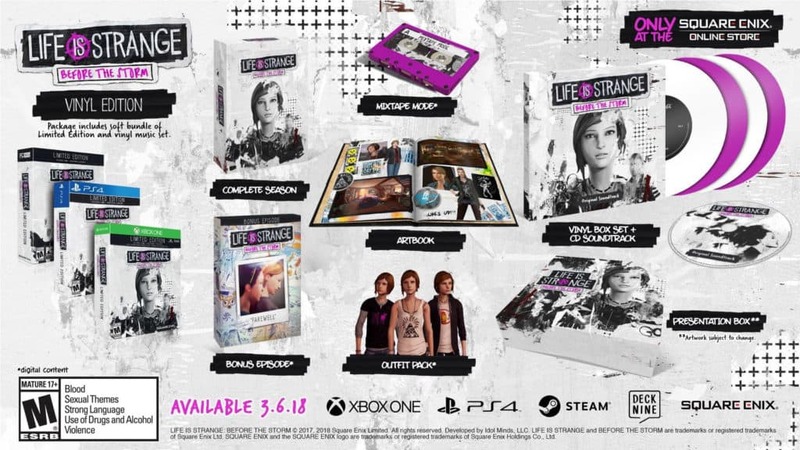 All three Life is Strange: Before the Storm physical versions will release on 6 March 2018. They are available for pre-order now at the Square Enix Store. The Limited Edition can also be found on Amazon. The game is available on PlayStation 4, Xbox One, and Microsoft Windows.